Now that Amelia is in school and is nearly 6 I have been looking at giving her bedroom a little makeover and making it more age appropriate to hopefully last into her early teens. 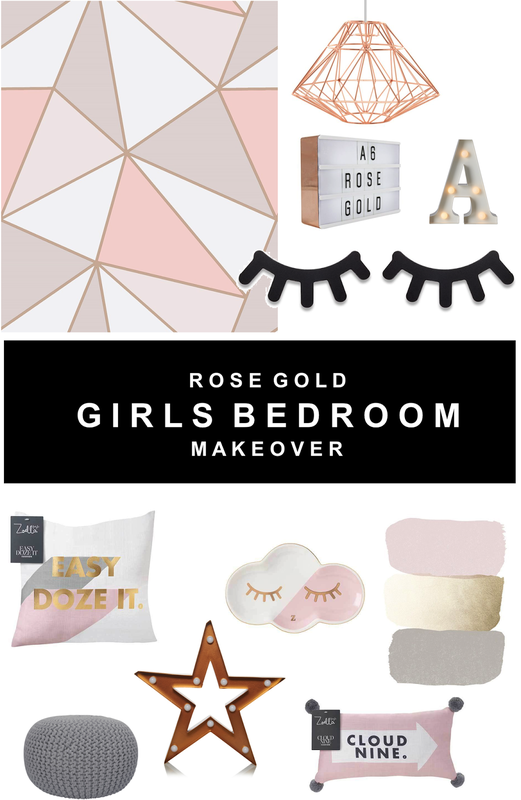 I've really been loving the rose gold and blush trend going on at the moment, there's so many nice bits like bedding and accessories in the shops at the moment so I thought it would go well in her room and hopefully she'll like it too. She already has newish furniture so that will last her for now but I would like to get her a little white desk and an Eames chair in a couple of years so she can do her homework there. Here are some of the bits I've been looking at purchasing for her bedroom. Ever since we moved into this house over 4 years ago the walls have been painted white. I do love how easy is is the change a room around with the walls being a neutral colour but I have been wanting to add a feature wall with Textured wallpaper to add some colour to her room. I came across this gorgeous geometric wallpaper on Instagram a few months ago and it keeps popping up everywhere and I think it would be perfect for Amelias bedroom. I thought it was nice and girly but also would last her whilst growing up. I thought this sleepy eyes wooden wall decor would be cute on the wall above her bed. I'm not sure what colour to buy yet but most likely either white, black or pink. I recently came across Zoella's Cloud 9 and Eazy doze it cushion whilst browsing Instagram and thought they'd look cute. In fact if I wasn't trying to phase out pink from my bedroom I'd totally buy them for myself! I recently bought myself a black pendant lampshade for my bedroom which I absolutely love and now want to change all of the lampshades in the house. Amelia still has one from when she was a baby so I thought it was about time I updated it. This copper pendant lampshade would go perfect with the decor. The only other things I still need to buy are some nice curtains, a rug and some new bedding. I have seen some lovely geometric and marble bedding sets in Primark so will most likely pick up a couple from there. I have a few lightboxes scattered around the house but don't have one in the kids rooms. I found this rose gold A6 size one and thought it would be perfect to go on a shelf or next to her bed to add a little bit of inspiration. I thought this grey knitted pouffe would be great for somewhere for Amelia's to sit and read. She already has a little reading nook with the ikea picture ledges on the wall which I change up her books regularly. This cute light up letter would most likely go on a shelf or next to her bed. I thought it would be nice to add some light up decorative bits and have also been looking at cotton string balls to go over the headboard. What do you think of the rose gold trend? There are some really beautiful finds here. I like that you're thinking ahead of something she'll still like when she reaches her early teens. The rose gold trend is one of the few I can actually get on board with because everything just looks so much better in this shade! I think it's a bit of a challenge trying to decorate a child's room as there are many factors to consider, ranging from budget to likes/dislikes. It's important to strike a balance between your expectation and theirs. We recently wrote a blog about room decor and a child's development, i.e., whether a child's room decor is in any way associated with their development . I will be more than grateful if you could provide some comments.